It is said the development of woven clothes ushered an altogether newer epoch of human civilization, whose roots have taken an even stronger form, albeit in a more refined, sophisticated and technologically driven manner. As the methods and machines underwent gradual innovation and moved towards automated machines to maximize productivity, so did the need of textile raw material supplements and chemicals which formed a vital part of the cycle. 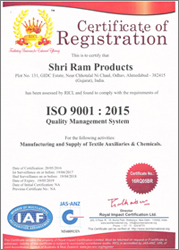 Since its inception in 1983, Shri Ram Products has been a name synonymous with quality, innovation, creativity and trust in the domain of textile industry through its range of chemical essentials that are brought to use in the pre-fabrication processes. Backed by a team of qualified technicians and diligent marketing personnel who provide the necessary impetus, we have established ourselves as a noted manufacturer, exporter and supplier of textile and dye auxiliary compounds such as silicon deformers, de-dusting oils, dye fixing agents and mercerizing chemicals, to a name a few.